With Google+ almost two weeks into its test phase, conversation about this new social network service seems to be going in circles. Literally. That’s because Circles is the Google+ feature that users are generating the most buzz about. It’s Google’s answer to the problem of organizing your social graph online. 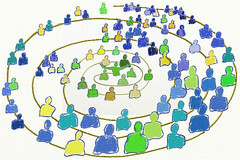 If you’re not familiar with a social graph it’s a map of everyone you know and how they are related to you.